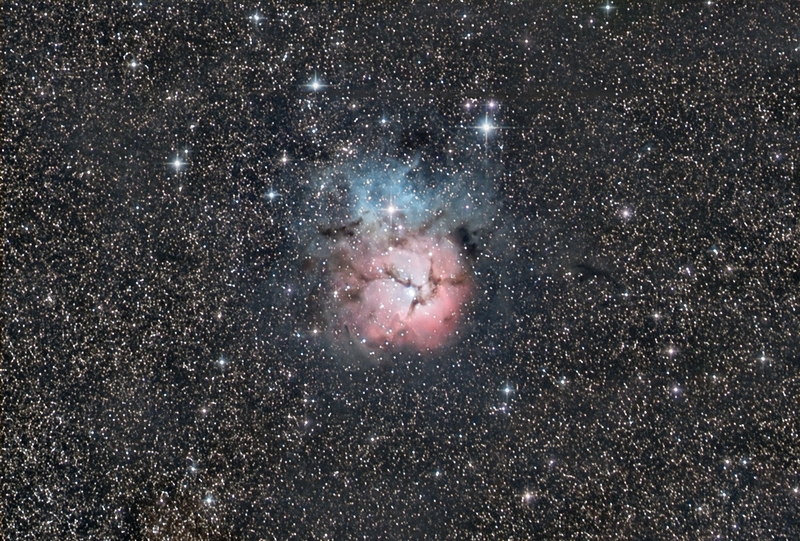 The Trifid Nebula M20 is a rare combination of an emission and reflection nebula. Hot young stars in the southern part of the Trifid have excited the hydrogen atoms in the surrounding gas, causing them to emit red light. In the northern part of the Trifid, in contrast, the stars are not hot enough to excite the gas; but the blue glow of the starlight being reflected by a myriad of dust particles is dominant in this color exposure. Some dust lanes which are not illuminated by starlight run in front of the emission nebula, forming the famous Trifid lines. M20 - Trifid Nebula, Wright-Newtonian photograph and CCD-image. Notes: Bad seeing, wind, and low altitude somewhat degarded this exposure series. I even had to correct for atmospheric refraction.